We deliver House Martin skirting boards and architrave throughout the South East of London, including the major areas of Lambeth, Southwark, Lewisham, Greenwich, Bexley, Bromley and Croydon. We have a comprehensive range which can be ordered online or by phone with delivery on a next day service*. Deliveries & Service: Deliveries can be made on a next day service throughout the South East of London. Any questions about our product or service, please send us an email or phone. We have a superb sample service, ideal for checking the design and size, just go to the product page and order online. 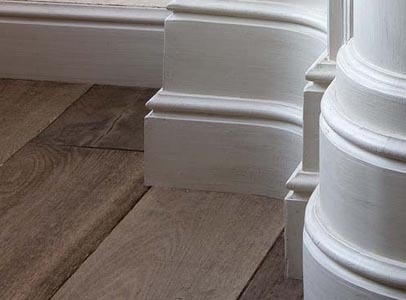 House Martin Mouldings: House Martin skirting board and architrave is made using a hardened polyurethane extrusion process, meaning our materials are waterproof, tough and hard. For additional creative effects use panel mouldings and LED lighting which can be fitted into our skirting boards. Installation: Using DIY skills and basic tools are all that are needed to install. 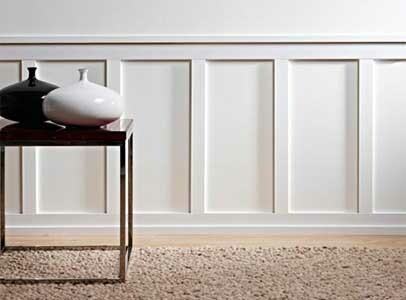 Using our skirting board and architrave products installation is considerably less work than with wooden skirting boards and architrave. Wooden skirting boards and architrave require much more preparation including sanding, knotting and painting with both primer and undercoat. House Martin skirting boards and architrave is supplied ready for the just the top coat of paint to finish. Use our specially formulated adhesives to ensure an easy fit. Orders come with detailed instructions. Benefits of Polyurethane: Hardened polyurethane has all the benefits of being a plastic and none of the disadvantages of wood. Joints can be smoothed with glass paper and gaps filled with caulking, and then the entire product painted. Repairs at a later date can be made in exactly the same way. Our material is harder than most wooden skirting board and architraves and therefore more impact resistant and less easily dented. Hardened polyurethane is a waterproof material, a major advantage compared to MDF and wood. Bathrooms, kitchens and utility rooms will all significantly benefit from this material, as will any laminated or tiled floor. Many of our designs have a flexible option, unique to our products. These are designed to be used on curved walls and bays with the rigid on the straight walls.